Now that you understand what reincarnation is for (your path to perfection), the question is how do you succeed? What should be the governing philosophy of your life that will not only allow you to survive your trials but emerge victorious? Read More. All of us have felt ready to give up the battle. In the book, Spiritual Wisdom: Missives of Hope, Chico Xavier writes of a young man who told others in the mediums meeting that he felt overwhelmed. His trials were too difficult, he could not find the inner strength to continue. He believed that he had signed up for an impossible task and could not decipher how he could surmount his problems. Read More. Geraldo Goulart has found some older books by spirit authors that are in PDF. They may be of interest to you. None of them are official Spiritist writings, but I see many similarities and interesting observations. I have no knowledge if these are true or not. In the book, Jesus in the Home, psychographed by Francisco C. Xavier and dictated to him by the spirit Neio Lucio, there is a discussion about what is meant by the meek shall inherit the earth. In Peter’s house, where many chapters of the book take place, the disciples are heatedly debating how could this be. After all, if only evil was strong and aggressive how could good ever emerge victorious? Read More. “It is no light matter, I do assure you, to receive the command ‘Go forth downward.’ For as we proceed earthward, both the brightness of our environment and of our own persons also grow less and less, and by the time we reach the neighborhood of earth we can but with difficulty see about us.” Read More. There is an interesting section in a translated communication titled The Life of Jesus. It was reportedly a communication from spirit Jesus to a medium in France in the 19th century. The medium was only known as Medium X. The book was translated into Italian, then Spanish, then into English. It was not completed until a second medium took up the work in the 20th century. Read More. 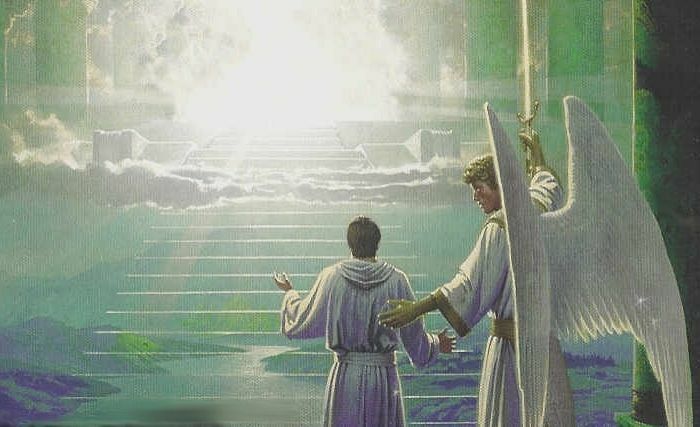 There is a short three paragraph description of how spirits communicate with other spirits at different levels, by the spirit Zabdiel, who resided in the tenth level of heaven, when he communicated to the Rev. G. Vale Owen in 1910. The passage lacks details, but the central theme is the need to condition oneself spiritually to speak with spirits superior to oneself. Read More. The Rev. G. Vale Owen, or G.V.O. to his friends and congregation was a Church of England minister who psychographed messages from spirit world, in the 1920s. His works correspond with previous Spiritist writings by Allan Kardec and the future works by Francisco (Chico) C. Xavier. His books revealed many levels of heaven and the life of the spirits around us. Read More. Did you know that Carl Jung, the famous Swiss psychiatrist had a NDE and it enabled him to comprehend the world around him in a different light. Read More.